Aflatoxin B1 (AFB1) and zearalenone (ZEA) are the secondary toxic metabolites of fungi which contaminate a wide range of food and feedstuffs. Limiting exposure of humans and livestock to them is very essential. Among numerous methods of mycotoxin-degradation, biodegradation by microorganisms and enzymes is an effective and promising approach to eliminate their hazards. The present study aims to optimize the proportion of different species of beneficial microbes by means of response surface methodology (RSM) and its combination with mycotoxin-degradation enzymes. The results indicated that AFB1 and ZEA degradation rates were 38.38% and 42.18% by individual Bacillus subtilis (P < 0.05); however, AFB1 and ZEA degradation rates reached 45.49% and 44.90% (P < 0.05) when three probiotic species such as Bacillus subtilis, Lactobacillus casein and Candida utilis were at a ratio of 1:1:1, corresponding with the predictive value of the RSM model. The further experiment showed that AFB1 and ZEA degradation rates were 63.95% and 73.51% (P < 0.05) when the compound of three probiotic species was combined with mycotoxin-degradation enzymes from Aspergillus oryzae at a ratio of 3:2. This result indicated that the combination of probiotics with mycotoxin-degradation enzymes is a promising new approach for synchronous detoxification of AFB1 and ZEA. As estimated by the Food and Agriculture Organization (FAO) of the United Nations, about 25% of the global food and feed are contaminated by mycotoxins (Fink-Grenmels and Georgiou, 1996). One-third of feedstuffs from the Asian-Pacific region are positive for mycotoxins, including aflatoxin B1 (AFB1), zearalenone (ZEA), deoxynivalenol (DON), fumonisin B1 (FB1), nivalenol (NIV), ochratoxin A (OTA), citrinin (CIT) and patulin (PAT) (Binder et al., 2007; Richard, 2007; Zhu et al., 2016). Mycotoxins not only lead to significant economic loss of crops annually, but also frequently contaminate food and animal feeds to pose a potential health threat to humans and livestock (Mohamed, 2011). Among the mycotoxins, two of the most dangerous and common mycotoxins are AFB1 and ZEN (Wu, 2004). The most commonly occurring AFB1 is both acutely and chronically toxic to animals and human beings, causing acute liver and renal damage, hepatic cirrhosis, carcinogenic induction, mutagenic and teratogenic effects (Wild and Turner, 2002). ZEA, also known as F-2 mycotoxin, is produced by Fusarium species, mainly by F. graminearum and F. Culmorum. ZEA and its derivatives are an important class of endocrine disrupters, which can cause estrogenic effects and alterations in the reproductive tract of laboratory and domestic animals (WHO, 2000). It was reported that there were 72% of feed and raw materials tested positively for at least one mycotoxin, and 38% were found to be co-contaminated with multi-mycotoxins (Streit et al., 2013). Various mycotoxins may occur simultaneously due to the different species of microbes, environmental and substrate conditions. Considering this coincident production, it is very likely that humans and animals are always exposed to mixtures rather than to individual mycotoxin. Therefore, it is worthless that most studies focus on individual mycotoxin contamination without considering the natural processes where multiple mycotoxins can be produced. Co-contaminated feeds or food probably lead to adverse negative effects even though the concentration of the individual mycotoxin does not surpass the legal maximum limit. Therefore, future risk assessments should consider mixture toxicity other than the individual mycotoxin. The interactions among various mycotoxins are complex, which will require further research. In order to degrade mycotoxins, physical and chemical approaches have been conducted (Ramos et al., 1996; Torlak et al., 2016). However, most of these methods are impractical or potentially unsafe, due to losses of nutritional value, high costs, environment pollution and formation of toxic residues or derivatives (Park, 1993; Lemke et al., 1998; Kabak et al., 2006). It is reported that the best approach for mycotoxin decontamination should be from the microbial degradation, due to a possibility of removal of mycotoxins under mild conditions without negative effects (Molnar et al., 2004). For instance, there are some reports about Mycobacterium fluoranthenivorans, Rhodococcus erythropolis and other microbes related to their potentials of aflatoxin degradation (Teniola et al., 2005; Krifaton et al., 2011; Cserháti et al., 2013). Other studies indicate that ZEA can be degraded by Pseudomonas sp., Rhodococcus pyridinivorans and S. Cerevisiae (Altalhi, 2007; Kriszt et al., 2012; Gupta et al., 2012). Liu et al. (1998) demonstrated that aflatoxin detoxifizyme obtained from Armillariella tabescens showed AFB1 detoxification activities. Liang et al. (2008) reported that the crude enzyme isolated from Stenotrophomonas could degrade AFB1 by 85.7%. Zuo et al. (2013) reported that the cooperation of both probiotics and AFB1-degradation enzyme can degrade AFB1 efficiently; however, the combinations of probiotics and mycotoxin-degradation enzyme for synchronous degradation of both AFB1 and ZEA have not been reported. Response surface methodology (RSM) has been widely used to estimate the relationships among a set of controllable experimental factors and obtained data (Prasad et al., 2011). Compared to the traditional methods, RSM can define the effects of independent variables on the responses as well as the interaction between parameters to achieve the best system performance (Belwal et al., 2016). The aim of the present study was to evaluate the combined efficacy of the probiotics and mycotoxin-degradation enzymes in reducing the adverse effects of AFB1 and ZEA simultaneously. AFB1 and ZEA were purchased from Sigma (St. Louis, MO, USA), and dissolved in methanol to obtain the concentrations of 50 μg/mL and 500 μg/mL as stock solution. Aspergillus oryzae (A. oryzae), Lactobacillus casein (L. casein), Bacillus subtilis (B. subtilis) and Candida utilis (C. utilis) were purchased from China General Microbiological Culture Collection Center (CGMCC). B. subtilis was inoculated in LB medium (g/L): 10 g tryphone, 5 g yeast extract, 10 g NaCl, pH 7.0; culturing in a rotary shaker with 180 rounds per min (rpm) at 37°C for 24 hr. L. casein was inoculated in MRS medium (g/L):10 g tryphone, 10 g yeast extract, 20 glucose, 1 mL tween 80, 2 g K2HPO4, 5 g sodium acetate, 2 g sodium citrate, 0.2 g MgSO4, 0.05 g MnSO4, pH 6.20-6.60; culturing with stationary state at 37°C for 24 hr. C. utilis was inoculated in YPD medium (g/L): 10 g yeast extract, 20 g peptone, 20 g glucose; culturing in a rotary shaker with 180 rpm at 30°C for 24 hr. Three species of microbes were harvested after 24 hr incubation for further use. The visible counts of microbes were adjusted to 2.5 × 109 count formed units (cfu)/mL with their corresponding media, respectively. The solid-state fermentation was carried out in the 250 mL Erlenmeyer flasks with cotton plug. The compositions of medium were as follows (w/w): wheat bran, corn meal and soybean meal at a ratio of 7:1:2, from which 15 g was weighted, added with 9 mL distilled water, homogeneously mixed and autoclaved. About 2 mL A. oryzae at 1 × 108 spores/mL were put in the sterilized medium, inoculated at 30°C for 7 d. For the following extraction of crud enzymes, the fermented media were mixed with 75 mL sterile saline (w/v) in a flask, shaken on a rotor wheel at 30°C and 150 rpm for 1 hr, then standing for 1 hr. The culture medium was filtered through eight-layer gauze, and then filtered through Whatman No.4 filter paper (20 to 25 μm pore diameters), centrifuged at 3,000 × g for 15 min to remove the small residue. The crude enzymes were filtered to remove microbes with 0.22 μm Minisart High-flow filter (Sartorius Stedim Biotech Gmbh, Goettingen, Germany), and finally the mold-free crude enzymes of A. oryzae were stored at 4°C for further use. AFB1-degrading enzyme activity (284.3 U/L) was determined with the previous protocol (Gao et al., 2011) and modified as the following: the amount of enzyme that could degrade 1 ng AFB1 per min at pH 8.0 and 37°C was defined as one unit, so did the ZEA-degrading enzyme activity (31.0 U/L) determination modified with ZEA as the reaction substrate. Quantifications of AFB1 and ZEA were performed by using enzyme-linked immunosorbent assay (ELISA). AFB1 and ZEA concentrations were determined by ELISA kits-RIDASCREEN® AFB1 30/15 test kit and RIDASCREEN® FAST Zearalenon SC test kit (R-Biopharm, Darmstadt, Germany) respectively, according to the manufacturer’s instructions. AFB1 and ZEA degradation rates were calculated by using the following formula: AFB1 (or ZEA) degradation rate = (1-AFB1 (or ZEA) concentration in treatment / AFB1 (or ZEA) concentration in control) × 100%. The germ-free media and sterile saline were used as the control. Design-Expert 8.0.6 software was used for the experimental design. Model fitting, statistical data analysis and central composite design (CCD) were applied. The CCD can be used to determine levels of various parameters and assess the interrelationships among all parameters simultaneously. The optimal parameters of B. subtilis, C. utilis and L. casein were selected and listed in Table 1 for RSM analysis. The final concentrations of AFB1 and ZEA in each run were adjusted to 40 μg/L and 500 μg/L, respectively. Each experimental run was added with 5 mL MRS liquid medium, and adjusted to 10 mL with sterilized saline. The probiotics were incubated in a rotary shaker at 180 rpm and 37°C for 24 hr. Each run was performed in triplicate. Table 1. Variable and levels used in the response surface methodology. “Y” is the predicted degradation rate of AFB1 or ZEA; “X1” “X2” and “X3” are the independent variables such as B. subtilis, C. utilis and L. casein, respectively; “β0” is the intercept; “β1” “β2” and “β3” are the linear coefficients; “β11” “β22” and “β33” are square coefficients; “β12” “β13” and “β23” are cross coefficients. Three species of beneficial microbes were harvested after 24 hr incubation, and the visible counts of each strain were adjusted to 2.5 × 109 cfu/mL, respectively. The composition of three probiotics was at a ratio of 1:1:1, which was combined with mycotoxin-degradation enzymes at the different ratios in Table 2. The final volume was 10 mL in a 50 mL Erlenmeyer flask. The final concentrations of AFB1 and ZEA were adjusted to 40 μg/L and 500 μg/L. Flasks were incubated with 180 rpm for 24 hr at 37°C. Table 2. Design of the combined compound probiotics with mycotoxin-degradation enzyme for AFB1 and ZEA detoxifications. All experiments were carried out in triplicate, and the experimental data were subjected to analysis of variance (ANOVA) with SPSS 20.0. The mean values and their significant differences were compared using Duncan’s multiple range test. Differences were considered statistical significance at P < 0.05. “Y” is the predicted response (degradation rate of AFB1 and ZEA); “X1” “X2” and “X3” are three independent variables such as B. subtilis, C. utilis and L. casein, respectively. Table 3. ZEN and AFB1 degradation rates by different species of microorganisms (%). Note: Each value represents mean ± S.E. of three replicates. Data followed by the different letters in the same columns are significantly different from each other (P < 0.05), while data followed by the same letters in the same columns are insignificantly different from each other (P > 0.05). The same applies below. Table 4. Central composite design (CCD) for parameter optimizations and the response values of AFB1 and ZEA degradation rates (%). Table 5. ANOVA analyses of response surface models for AFB1 and ZEA degradation. The response coefficients for AFB1 and ZEA degradation efficiencies are also listed in Table 5. In this case, C. utilis and L. casein had a significant effect on AFB1 degradation (P < 0.05), so did the quadratic terms of B. subtilis (P < 0.05). C. utilis and L. casein had an interactive effect on AFB1 degradation (P < 0.05). 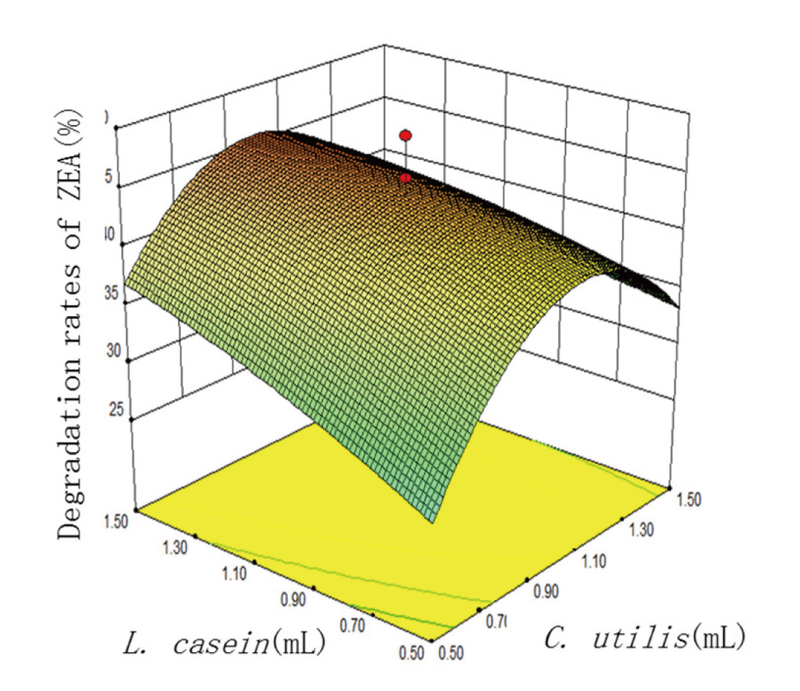 In addition, L. casein had a significant effect on ZEA degradation (P < 0.05), while B. subtilis and L. casein had an interactive effect on ZEA degradation (P < 0.05). This means that all factors considered in this study have an interactive effect on the degradations of AFB1 and ZEA. 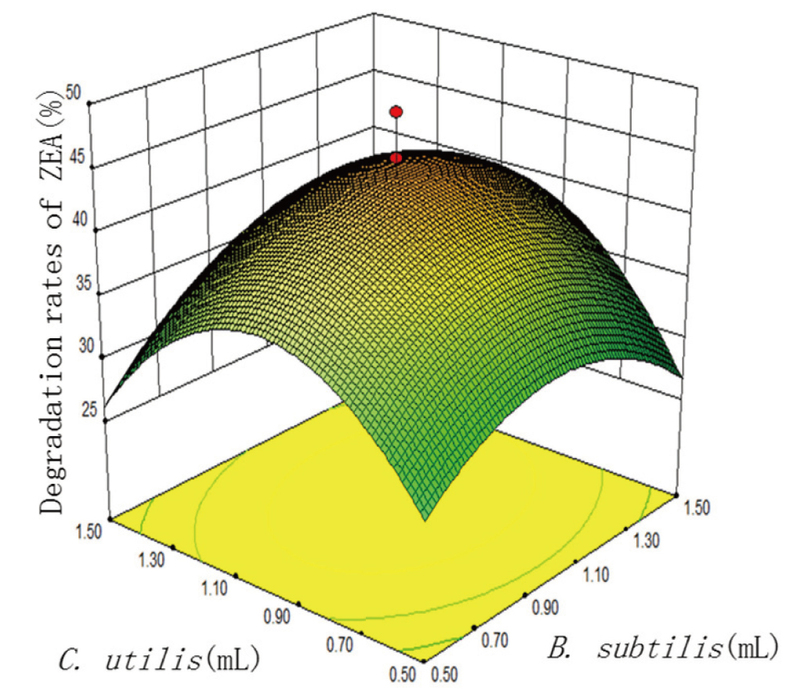 The response surface curves and its corresponding contour curves described by the regression model were constructed from Figs. 1, 2, 3, 4, 5 and 6. 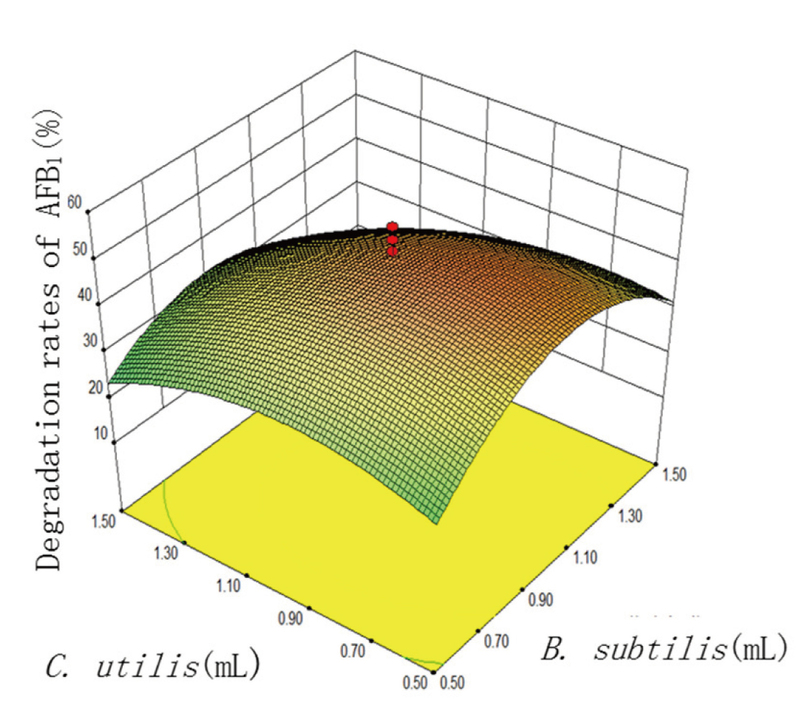 Each 3D response surface plot showed relative effects of two factors on degradations of AFB1 and ZEA, while the other factor stayed at level 0. With the help of RSM, this study showed that the optimal ration of B. subtilis, C. utilis and L. casein for degrading AFB1 and ZEA was 1: 1: 1. The further validating experiment proved that AFB1 and ZEA degradation rates were 45.49% and 44.90%, and the model predicted that AFB1 and ZEA degradation rates were 47.00% and 44.00%, confirming the validity of CCD model. Three-dimension response surface plots of interactions between C. utilis and B. subtilis for AFB1 degradation. The green lines indicate lower mycotoxin degradation rates. The same applies below. Three-dimension response surface plots of interactions between C. utilis and L. casein for AFB1 degradation. Three-dimension response surface plots of interactions between B. subtilis and L. casein for AFB1 degradation. Three-dimension response surface plots of interactions between C. utilis and B. subtilis for ZEA degradation. Note: The green lines indicate lower mycotoxin degradation rates; while red lines indicate higher mycotoxin degradation rates. The same applies below. 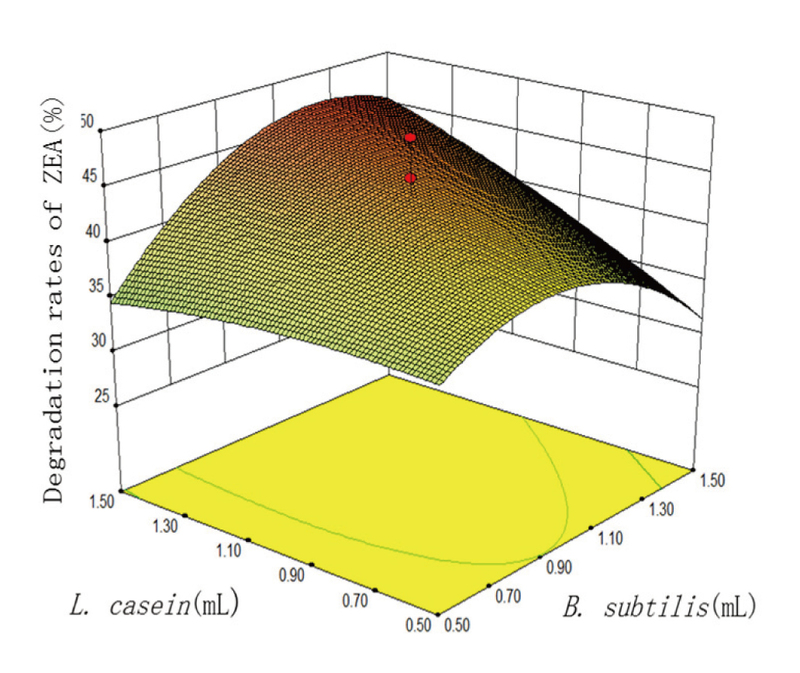 Three-dimension response surface plots of interactions between L. casein and B. subtilis for ZEA degradation. 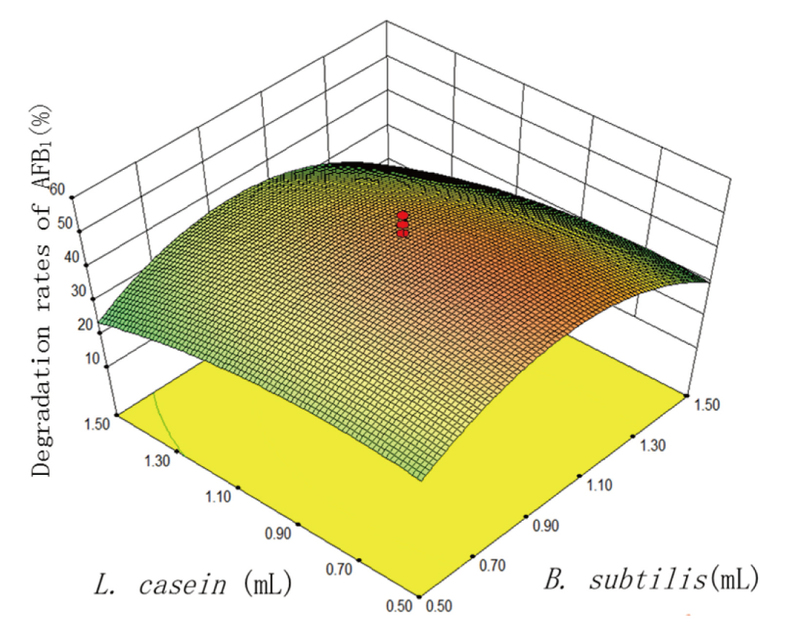 Three-dimension response surface plots of interactions between C. utilis and L. casein for ZEA degradation. Based on the above result and our previous research (Zuo et al., 2013), B. subtilis, L. casein and C. utilis with mycotoxin-biodegradation ability were selected for detoxifying AFB1 and ZEA simultaneously in this study. According to the previous methods for assessing the accuracy of statistical model (Kong et al., 2012; Wu et al., 2017), this study indicated that the established models were significant effective and stable for predicting degradations of AFB1 and ZEA. 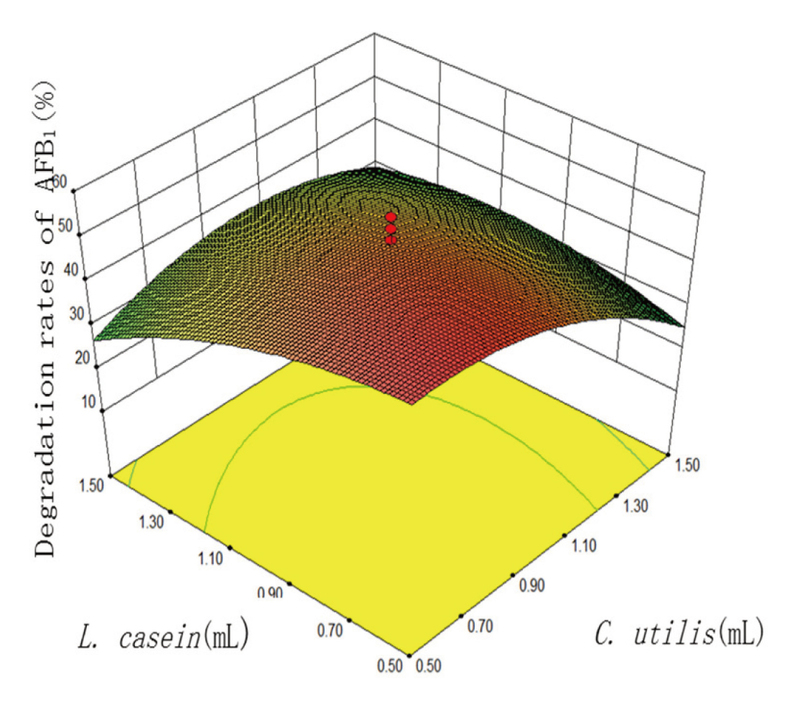 RSM is a useful tool to model and analyze the influence of several variables, providing a clear sight to optimize the response of applied parameters. It is the first time to obtain optimal compound probiotics by RSM for detoxifying AFB1 and ZEA simultaneously. Table 6 indicates that the degradation rates of AFB1 and ZEA were the highest in group 7 and group 9, compared with other groups (P < 0.05), inferring that the compound probiotics plus mycotoxin-degradation enzymes at a ratio of 3:2 and the single mycotoxin-degradation enzymes could degrade AFB1 and ZEA more effectively. Table 6. The degradation rates of AFB1 and ZEA by the combination of compound probiotics and mycotoxin-degradation enzyme. The mycotoxin-degradation enzyme from Aspergillus oryzae or its combination with compound probiotics has been proved to have the ability for detoxifying AFB1 (Zuo et al., 2013). It was indicated that the mycotoxin-degradation enzymes from Aspergillus oryzae were able to degrade ZEA as well as AFB1 effectively in this study. The reason why the mycotoxin-degradation enzymes need to be combined with the compound probiotics are due to the ability of probiotics for regulating gut microbiota and keeping animal health except for their detoxifying ability. Gao et al. (2011) reported that B. subtilis could be used as probiotics or as antidote for aflatoxin detoxification. Swamy et al. (2002) reported that yeast cell wall had high adsorption ability for mycotoxin removal. The previous research indicated that one or more enzymes might be involved in aflatoxin degradation by mold mycelia (Dimitrokallis et al., 2008). The application of enzymes or microorganisms capable of biotransforming mycotoxins into nontoxic metabolites has emerged as an alternative strategy in controlling mycotoxicoses in animals. In general, biotransformation is an effective and safe method for mycotoxin control (Schatzmayr et al., 2006). After considering probiotic beneficial application in animal feeding, the combination of probiotics and mycotoxin-degradation enzymes will be very useful to degrade mycotoxins for animal health and production performance. This work was financially supported by Henan Key Scientific and Technological Project (171100110500), Henan Production-Study-Research Cooperation Program (162107000069), and Natural Science Foundation of Henan Province (U170411404). Altalhi, A.D. (2007): Plasmid-mediated detoxification of mycotoxin zearalenone in Pseudomonas sp. ZEA-1. Am. J. Biochem. Biotechnol., 3, 150-158. Binder, E.M., Tan, L.M., Chin, L.J., Handl, J. and Richard, J. (2007): Worldwide occurrence of mycotoxins in commodities, feeds and feed ingredients. Anim. Feed Sci. Technol., 137, 265-282. Belwal, T., Dhyani, P., Bhatt, I.D., Rawal, R.S. and Pande, V. (2016): Optimization extraction conditions for improving phenolic content and antioxidant activity in Berberis asiatica fruits using response surface methodology (RSM). Food Chem., 207, 115-124. Cao, H., Liu, D., Mo, X., Xie, C. and Yao, D. (2011): A fungal enzyme with the ability of aflatoxin B1 conversion: purification and ESI-MS/MS identification. Microbiol. Res., 166, 475-483. Cserháti, M., Kriszt, B., Krifaton, C., Szoboszlay, S., Háhn, J., Tóth, S., Nagy, I. and Kukolya, J. (2013): Mycotoxin-degradation profile of Rhodococcus strains. Int. J. Food Microbiol., 166, 176-185. Dimitrokallis, V., Meimaroglou, D.M. and Markaki, P. (2008): Study of the Ochratoxin A effect on Aspergillus parasiticus growth and aflatoxin B1 production. Food Chem. Toxicol., 46, 2435-2439. Fink-Grenmels, J. and Georgiou, N.A. (1996): Risk assessment of mycotoxins for the consumer. In Residues of veterinary drugs and mycotoxins in animal products (Ennen, G., Kuiper, H.A. and Valentin, A. eds. ), pp.159-174, NL-Waseningen Press. Gao, X., Ma, Q.G., Zhao, H.L., Lei, Y.P., Shan, Y.J. and Ji, C. (2011): Isolation of Bacillus subtilis: screening for aflatoxins B1, M1 and G1 detoxification. Eur. Food Res. Technol., 232, 957-962. Gupta, S., Shah, J. and Balasubramanian, B.A. (2012): Strategies for reducing colorectal cancer among blacks. Arch. Intern. Med., 172, 182-184. Kabak, B., Dobson, A.D. and Var, I. (2006): Strategies to prevent mycotoxin contamination of food and animal feed: a review. Crit. Rev. Food Sci. Nutr., 46, 593-619. Krifaton, C., Kriszt, B., Szoboszlay, S., Cserháti, M., Szücs, A. and Kukolya, J. (2011): Analysis of aflatoxin-B1-degrading microbes by use of a combined toxicity-profiling method. Mutat. Res., 726, 1-7. Kriszt, R., Krifaton, C., Szoboszlay, S., Cserháti, M., Kriszt, B., Kukolya, J., Czéh, A., Fehér-Tóth, S., Török, L., Szőke, Z., Kovács, K.J., Barna, T. and Ferenczi, S. (2012): A new zearalenone biodegradation strategy using non-pathogenic Rhodococcus pyridinivorans K408 strain. PLoS One, 7, e43608. Kong, Q., Zhai, C., Guan, B., Li, C., Shan, S. and Yu, J. (2012): Mathematic modeling for optimum conditions on aflatoxin B1degradation by the aerobic bacterium Rhodococcus erythropolis. Toxins (Basel), 4, 1181-1195. Lemke, S.L., Grant, P.G. and Phillips, T.D. (1998): Adsorption of zearalenone by organophilic montmorillonite clay. J. Agric. Food Chem., 46, 3789-3796. Liang, Z.H., Li, J.X., He, Y.L., Guan, S., Wang, N., Ji, C. and Niu, T.G. (2008): AFB1 bio-degradation by a new strain-Stenotrophomonas sp. Agric. Sci. China, 7, 1433-1437. Liu, D.L., Yao, D.S., Liang, R., Ma, L., Cheng, W.Q. and Gu, L.Q. (1998): Detoxification of aflatoxin B1 by enzymes isolated from Armillariella tabescens. Food Chem. Toxicol., 36, 563-574. Mohamed, E.Z. (2011): Impact of mycotoxins on humans and animals. J. Saudi Chem. Soc., 15, 129-144. Molnar, O., Schatzmayr, G., Fuchs, E. and Prillinger, H. (2004): Trichosporon mycotoxinivorans sp. nov., a new yeast species useful in biological detoxification of various mycotoxins. Syst. Appl. Microbiol., 27, 661-671. Park, D.L. (1993): Perspectives on mycotoxin decontamination procedures. Food Addit. Contam., 10, 49-60. Prasad, K.N., Hassan, F.A., Yang, B., Kong, K.W., Ramanan, R.N., Azlan, A. and Ismail, A. (2011): Response surface optimisation for the extraction of phenolic compounds and antioxidant capacities of underutilised Mangifera pajang Kosterm. peels. Food Chem., 128, 1121-1127. Ramos, A.J., Fink-Gremmels, J. and Hernández, E. (1996): Prevention of toxic effects of mycotoxins by means of nonnutritive adsorbent compounds. J. Food Prot., 59, 631-641. Richard, J.L. (2007): Some major mycotoxins and their mycotoxicoses--an overview. Int. J. Food Microbiol., 119, 3-10. Schatzmayr, G., Zehner, F., Täubel, M., Schatzmayr, D., Klimitsch, A., Loibner, A.P. and Binder, E.M. (2006): Microbiologicals for deactivating mycotoxins. Mol. Nutr. Food Res., 50, 543-551. Streit, E., Naehrer, K., Rodrigues, I. and Schatzmayr, G. (2013): Mycotoxin occurrence in feed and feed raw materials worldwide: long-term analysis with special focus on Europe and Asia. J. Sci. Food Agric., 93, 2892-2899. Swamy, H.V., Smith, T.K., MacDonald, E.J., Boermans, H.J. and Squires, E.J. (2002): Effects of feeding a blend of grains naturally contaminated with Fusarium mycotoxins on swine performance, brain regional neurochemistry, and serum chemistry and the efficacy of a polymeric glucomannan mycotoxin adsorbent. J. Anim. Sci., 80, 3257-3267. Teniola, O.D., Addo, P.A., Brost, I.M., Färber, P., Jany, K.D., Alberts, J.F., van Zyl, W.H., Steyn, P.S. and Holzapfel, W.H. (2005): Degradation of aflatoxin B1 by cell-free extracts of Rhodococcus erythropolis and Mycobacterium fluoranthenivorans sp. nov. DSM44556T. Int. J. Food Microbiol., 105, 111-117. Torlak, E., Akata, I., Erci, F. and Uncu, A.T. (2016): Use of gaseous ozone to reduce aflatoxin B1 and microorganisms in poultry feed. J. Stored Prod. Res., 68, 44-49. Wild, C.P. and Turner, P.C. (2002): The toxicology of aflatoxins as a basis for public health decisions. Mutagenesis, 17, 471-481. World Health Organization (WHO). (2000): Evaluation of certain food additives and contaminants. Zearalenone. Fifty-third report of the Joint FAO/WHO Expert Committee on Feed Additives. WHO Technical Report Series, 896, 93-96. Wu, F. (2004): Mycotoxin risk assessment for the purpose of setting international regulatory standards. Environ. Sci. Technol., 38, 4049-4055. Wu, L., Qiu, J., Zhang, H., Sun, J., Hu, X. and Wang, B. (2017): Optimization for the production of deoxynivalenol and zearalenone by Fusarium graminearum using response surface methodology. Toxins (Basel), 9, 57. Zhu, Y., Hassan, Y.I., Watts, C. and Zhou, T. (2016): Innovative technologies for the mitigation of mycotoxins in animal feed and ingredients-A review of recent patents. Anim. Feed Sci. Technol., 216, 19-29. Zuo, R.Y., Chang, J., Yin, Q.Q., Wang, P., Yang, Y.R., Wang, X., Wang, G.Q. and Zheng, Q.H. (2013): Effect of the combined probiotics with aflatoxin B1-degrading enzyme on aflatoxin detoxification, broiler production performance and hepatic enzyme gene expression. Food Chem. Toxicol., 59, 470-475.